Potato Crust Quiche 4 Days! Sure it’s real simple. I used about 1lb. of potatoes, skins left on. I boiled them in a pot with ~4 qt. of water and a good tablespoon of salt; once at the boil, let them go for about 30-40 minutes (depending on the size of the potatoes). Drain. Transfer to a food processor with 2 tablespoons of butter, 1 tablespoon of salt, and flavor: in my case 1 tablespoon of parsley and a pinch of a paprika-like spice. Pulse on 1 until you see the consistency turn a little doughy. The butter is what whips it into this consistency; everything else is to taste. I’m still experimenting with it myself. You can see how the crust slightly retreats from the (greased) pan lid once baked. I used Yukons but Russets work just as well; red potatoes not so well. Along with a follow-up shot, there are 4 pieces this big! 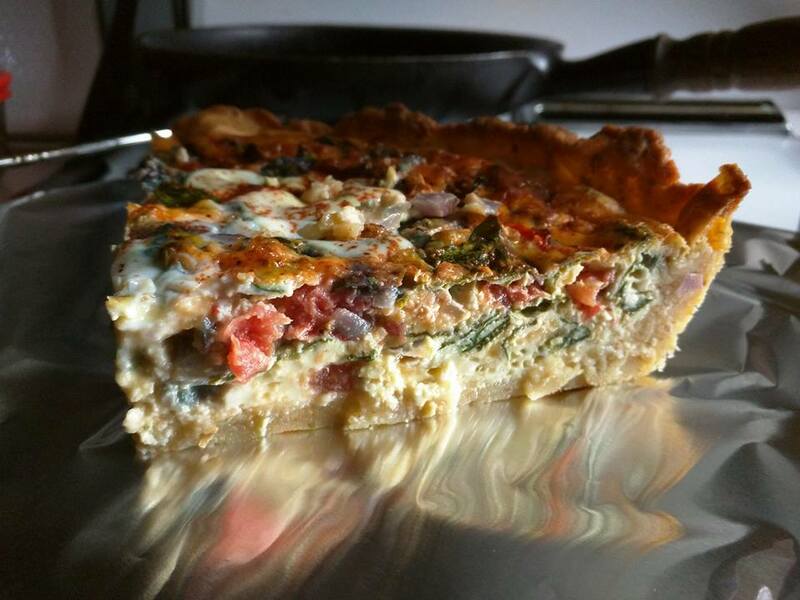 Thus #Quiche4Days!